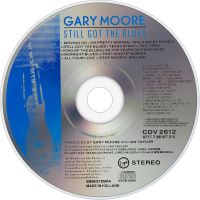 Still Got the Blues is a 1990 album by guitarist Gary Moore. Prior to this album Moore's work had consisted of predominantly jazz-fusion with Colosseum II and rock and hard rock styles including his work with Skid Row, Thin Lizzy, G-Force as well as a large repertoire of solo work. This album, as evidenced by its title, is a departure from hard rock to an electric blues style. Still Got the Blues has been arguably the most successful of Moore's solo albums as it was well received by old fans and also converted many who had never before heard of the Irish guitarist. The album's visibility and success was assisted by contributions from well known veterans Albert King, Albert Collins and George Harrison. Moore chose to record his lead vocal in the control room with the then just released Shure Beta 58 supercardiod microphone rather than the studio typical big phantom powered condenser microphone in a sound booth. It is argued that this assisted him to achieve a greater passion and live feel while still maintaining studio polish. The title track was released on the single format and reached #97 on the Billboard Hot 100 on 16 February 1991. It is the only single of Moore's to chart in the Billboard Hot 100. The album reached #83 on the Billboard 200 on 16 February 1991, then was certified gold by the RIAA on November 1995. This is the most successful album both in sales and chart positions from Gary Moore in the US.